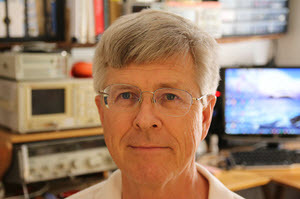 Pete Friedrichs wrote a pair of unusual and interesting books about building your own electronics. I don't mean assembling PCBs with standard ICs. No, these books address building components themselves. In Voice of the Crystal Pete set himself the goal of building a crystal radio entirely from scratch, using technology available in the golden age of these radios, 1920. Now, I did build a crystal radio over 50 years ago, but that was using a supplied earphone, diode, and Quaker Oats oatmeal box for the coil. Pete writes about making his own headphones from shoeshine polish cans. And building detectors from razor blades and galena crystals. Then there's the headphones made from the bit of piezo crystal salvaged from a lighter. Tuned circuits require a capacitor, generally, and Pete makes his own. Really. He calls them condensers, as that was their name in 1920. Remember pre-electronic ignition systems in cars? These all had a capacitor, but for some reason they were always referred to as condensers. Pete doesn't have much luck using an air gap as the plates tend to short out, but he then adds an insulating dielectric which works well. He also shows how to build a variable inductor. It's a pain to disassemble, so I won't, but the antenna tuner for our sailboat's SSB radio uses a huge roller inductor, where the coil is made of about 5 mm diameter tubing wrapped in a spiral. 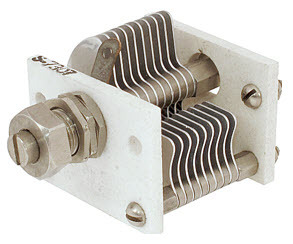 It rotates, and a wheel tap advances along the spiral to vary inductance. Many of the components are simply beautiful. Pete mounts them on nicely finished boards, rather like how old-time electronics were built. He explains the basics of how each component in a crystal radio works. For EEs this is pretty elementary stuff, but I imagine a motivated hobbyist could glean a lot of basic electronics from it. I also read Pete's Instruments of Amplification, which, as the name suggests, is all about using active elements. This book starts with a study of amplification, which dates to pre-vacuum tube systems. Trying to send a Morse signal a long distance? The signal will eventually fade, but one can place an "amplifier" of sorts in the middle of the line. This is nothing more than a relay activated by the signal. It doesn't take much energy to cause the relay's contacts to close, but those contacts can blast another full-strength dit or dah down towards the intended receiver. Transformers can amplify, too, though there will always be a power loss. Pete shows how to make a custom transformer. He also shows how sliding a wire down a file, which makes and breaks contacts, can energize that transformer and generate very high voltages. I remember doing something similar in high school, using a ringing bell to cause a sort of AC waveform to a transformer. But then he gets into making vacuum tubes. Really. I have no interest in ever doing this, but it's fun to see how he goes about it, and he gives an appreciation for how hard the early tube experimenters had to work. He uses common around-the-house materials like glass canning jars. The one exception is a pretty good vacuum pump. His tubes need vacuums around 20 millitorr. His explanation of how tubes work is excellent and sophisticated. What about semiconductors? The explanation of how transistors work is one of the best I've seen. Pete shows how to make several kinds of transistors. One, a point-contact model, uses plumber fittings and silicon recovered from a 1N34 diode. Another uses a sheet of copper, dimpled, coated on two sides with cuprous oxide. And they work! At least for a time till they burn out. But he was able to run a curve tracer to profile the transfer function. The books are quite readable though, unless you're following his step-by-step instructions, you might want to skip over the paragraphs about where to insert those 6-32 screws and other details. Building your own components is pretty quirky and not something most of us will ever do. But the books are fun and educational. Get the books from http://hpfriedrichs.com/mybooks/bks-buyit.htm. He tells me: "For what it's worth, it has been my practice to send free copies to any public or school library requesting them. The Voice of the Crystal has been transcribed into an audiobook format for the visually impaired. I can provide that to interested parties for free, as well. "